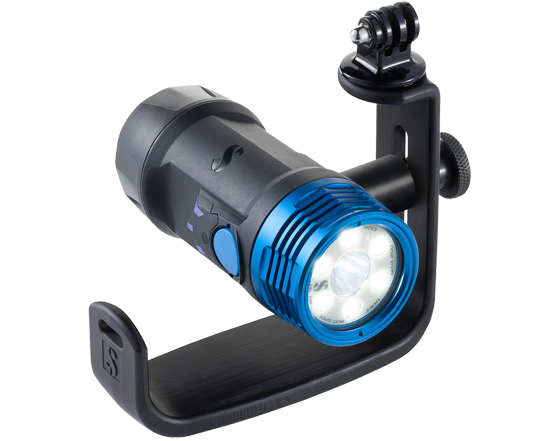 The powerful new Nova 2100 SF (Spot Flood) multi-use dive light offers both a 65º wide beam and a 15º spot beam to perfectly match different diving situations. 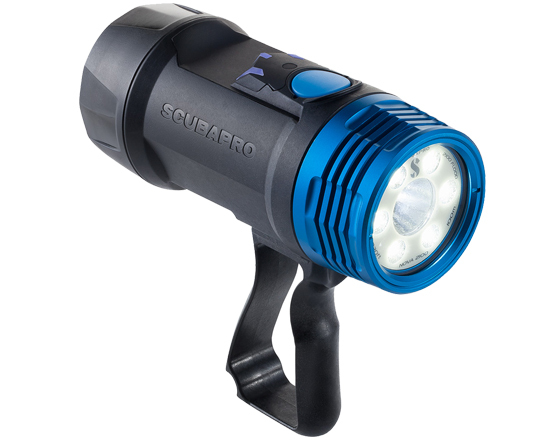 Five light modes plus an emergency signal mode provide lots of versatility, with one-button control for easy operation. Members earn 1,050 Points on this purchase! 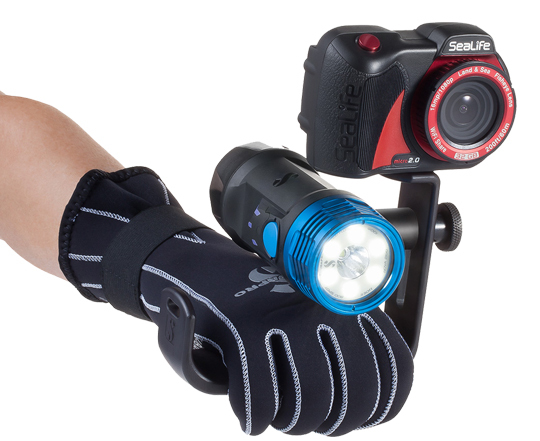 Five light modes plus an emergency signal mode provide lots of versatility, with one-button control for easy operation. 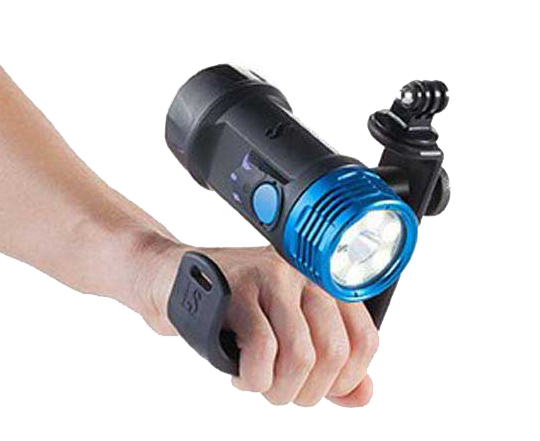 Extremely reliable, the waterproof battery compartment is isolated so even if the O-ring seal fails, water cannot reach the internal electronics. The Nova 2100 SF comes as a set with both a large and a small a Goodman handle, plus a pistol grip handle and a GoPro adapter. 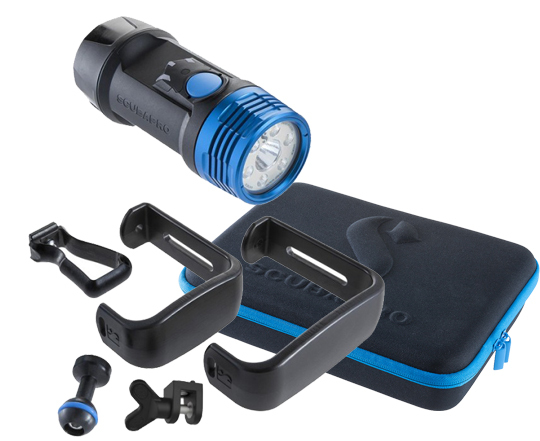 The light comes with a wrist lanyard, rechargeable battery, charger and spare parts, all packed in a zippered EVA carry case. Dual beams include a powerful 2100 lumen 65º wide beam, and 800 lumen 15º spot beam. Wide beam features 6 Cree XM-L2 LEDs; the spot beam features 1 Cree XPL LED. Five primary light modes: 100% Flood, 50% Flood, 100% Spot, 50% Flood + 75% Spot, and 25% Flood + 50%Spot. Hidden emergency signal mode offers a one-second blink interval or a SOS Morse code. Simply push and hold the power button for four seconds to activate. Simple one-button control lets you power on and off, adjust brightness and switch beam angle. Provides 55 minutes of burn time at full power and constant brightness. Depth tested to 100m/328ft. Corrosion-proof metal light head improves heat dispersion and increases durability. Completely isolated battery compartment protects internal electronics from water intrusion. Universal 1⁄4-20 tripod mount attaches to a Goodman handle, Monopod or optional Y-S adapter. AC power adapter, charging tray, international plug adapters. EVA carry case with foam insert and instruction manual.